It's been a while since I last reviewed a mascara. Well, because I had to finish the other one before opening or buying a new one. Lifespan for mascaras is really short and I don't want to waste money so yeah, finally, I was able to change brand. This one is actually a prize I got from Ms. Kira Ramirez. See my haul here. 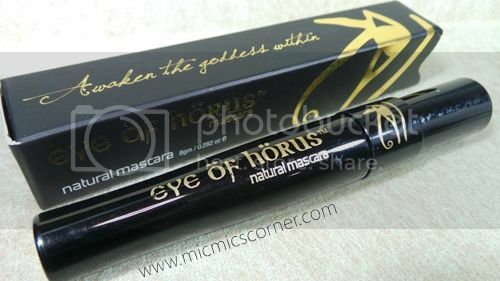 The Eye of Horus range of Goddess eye makeup is based on Ancient Egyptian formulas and ingredients, including Carnauba wax, Rice Bran wax, Candelilla wax and the revered Moringa oil claimed by the Gods for its beautifying and regenerating powers. If you’re after perfect natural mascara that won’t run, smudge or clump, Eye of Horus natural mascara is exactly what you are looking for. Formulated in the style of the ancient Egyptians, Eye of Horus mascara uses natural, non-irritating ingredients, making it ideal for sensitive eyes. It strengthens and lengthens for ultimate Goddess lashes. 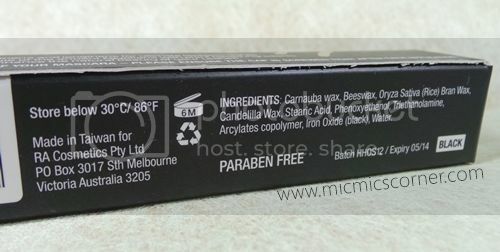 The waxed based product can sometimes settle at the base of the container. If it appears dry move wand in and out slowly 3 times while still inside container, so no air gets to wand, and then bring up inside of container slowly, while twirling it around the barrel of the container. This will “prime” it. Always close cap tightly after use to ensure air doesn’t dry product out. To ensure thick, long lash application, commence by brushing top of lashes from roots out to tip lightly. Make sure you wiggle the wand left to right at the base of lashes. It's the mascara placed near the roots -- not the tips -- that gives the illusion of length. Now while still wet, brush front lashes – the application on the top lashes helps the front lash application “stick” and become even more volumous. Pull the wand up and through lashes, wiggling as you go. The wiggling part is key because it separates lashes. 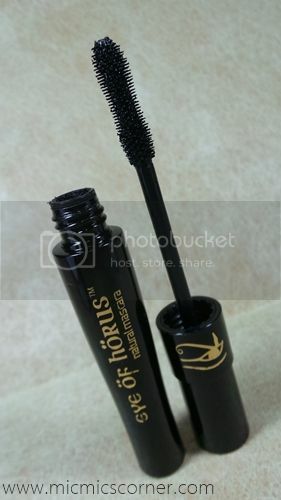 It is housed inside a sleek looking black mascara tube with the name of the product printed in gold. I love how black and gold were combined to achieve a sophisticated look to it. Hmm, insteresting. 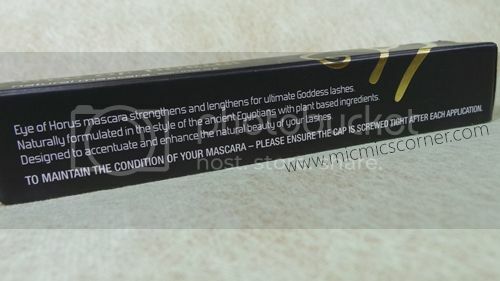 Ultimate Goddess lashes? I want that! I originally have thin lashes, some are short, uneven in length. A mascara that will definitely enhance my lashes, I'll forever love. I love that it is Paraben free and that ingredients are plant based. 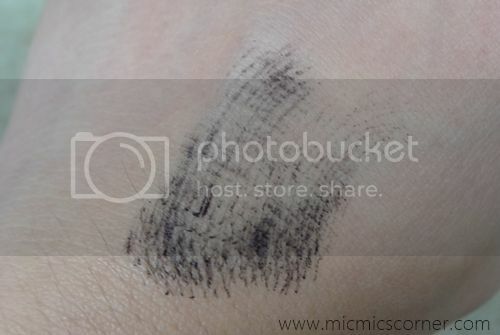 This is suited to those who reacts easily to synthetic mascaras. Also, it has expiry date and shelf life printed. Disregard expiry date when you open it. Mascaras have a shelf life of 6 months only. The want is quite big for me. I even poked my eye one time when I was using this. If you will look closely, the bristles are a bit pointed that's why I really got hurt when I accidentally poked my eye. Well, I'm the one to blame, haha. The design on how the bristles are separated is nice because it coats lashes really well. The wand is, I think, made of flexible rubbery material because it bends making it easier to apply mascara even to the corners. 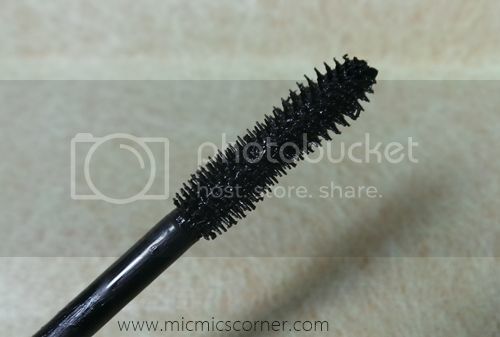 The formula of the mascara is just right, not too dry but not to wet. It dries quickly too but a bit sticky. I felt my lashes hardened a bit and kinda felt stiff. I can really tell that I have mascara on. Lengthened and volumized mylashes because of its wand. Held the curls for 7 hours. My lashes felt hard and stiff whenever I have this on. Though I like the wand because of the bristles and it's flexibility, I still find it quite big. 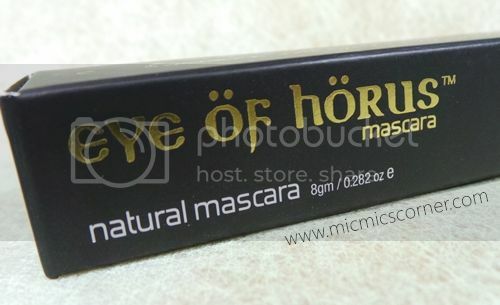 Though available locally, I think you can only purchase it here through GlamourBox. This is a good mascara. It's not something that I will be tagging as my HG mascara but still, it delivered pretty good results. But for the price and since it's not that easily accessible, I think I won't be repurchasing at the moment. I'm gonna try other brands first. I've been always curious about this mascara. Thanks for your review sis! I think I'll give it a pass. still, I'm a maybelline mascara lover hehe. I'll check that after ko maubos yung iba kong mascaras. Thanks sis! your beauty product reviews are always good indeed. I have sparse lashes, that's why. I saw Beauty by Tellie's review and she liked it. It actually looked naturalon her lashes.